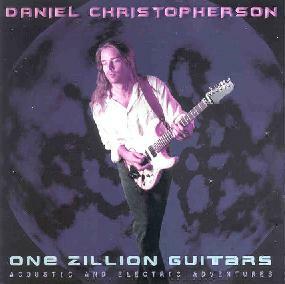 Daniel Christopherson - "One Zillion Guitars: Acoustic And Electric Adventures"
Satriani, Vai, Johnson, and Morse fans step right up. Daniel Christopherson is right up your alley. A guitar shred-meister with chops, melody, and style. I'd love to hear people like this do something more tripped out or experimental, but though they're light years ahead of the big hair rockers on MTV the music is ultimately aimed in that direction. But there's always a little something these musicians offer that include some tasty bits. Most of "Door Of Fire", the opening track, is killer rocker reminiscent of old Blue Oyster Cult, but it alternates with whimpier bits that sound like an old Tom Petty song I can't remember the name of. "Cloud 10" and "Midnight Flyer" are melodic Dixie Dregs styled tunes. There's a bit near the end of "Cloud 10" that combines about 4 contrasting guitar styles for a jam that was one of my favorite moments on the album. Rock, funk, jazz, wah'd psych... a nice glom. "Midnight Flyer" had some brief but cool fiery wah'd bits too. "The Dream Of A Closed Heart" is another melodic tune, but there's a lot happening guitar-wise that I'd be quick to write off during a cursory listen. Cool ambient syncopated guitar patterns are buried in all the floating melody, but this is all too brief as it soon launches into a more standard rocker, but thankfully ends with the more interesting bits it began with. "Sunflower Planet" and "The Forrest Comes To Me" are two tracks that play like one. "Sunflower Planet" surprised me by starting off a bit on the cosmic spacey side, but it soon segues into "The Forrest Comes To Me" which is a light jazzy piece. I knew it was too good to be true. "Otherworld" features multiple varied guitar parts that combine melodic acoustic guitar, jazz, and some surprisingly freaky ambient sounds. Another track with great potential but there are too many lightweight parts. The rest of the album features loads of Daniel's great playing and well structured songs though in many cases I could easily imagine vocals being added and it would be ready for MTV. Note that when you pop the disc into your computer you can access six extra tracks in Mp3 format, including an interview with Daniel. In summary, Daniel Christopherson can PLAY. No question about it. And while guitar shred freaks will undoubtedly love this album I think it would leave AI readers with more eclectic tastes wanting. But the good moments do indicate Christopherson has the potential to freak out and rock hard with the best of them if he chose to. For more information you can visit Daniel Christopherson at his web site. There are several sound files available at this Mp3.com web site. Contact via snail mail c/o Rainmaker Publicity; 398 Columbia Ave; PMB 183; Boston, MA 02116.